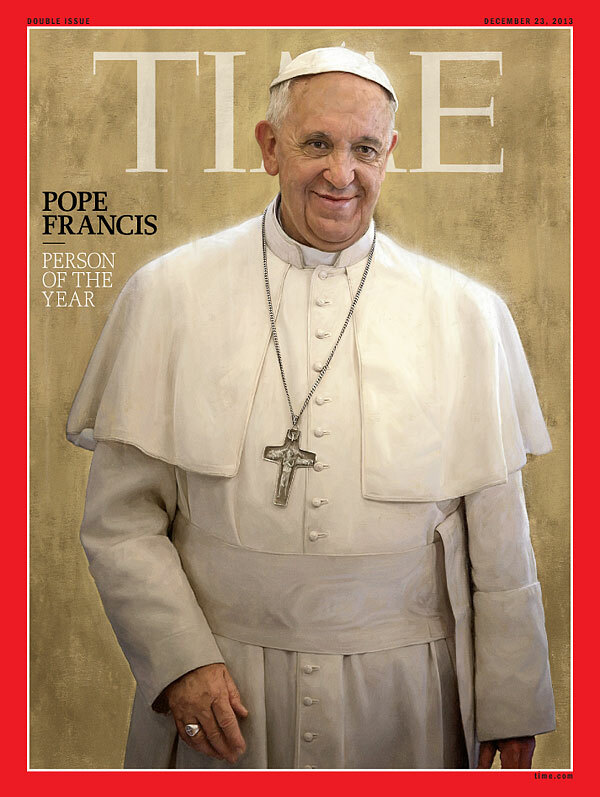 Time Magazine just announced that their Person of the Year is Pope Francis, The People’s Pope. Time Magazine’s Managing Editor, Nancy Gibbs, discussed why Pope Francis was their choice for Person of the Year. How do you practice humility from the most exalted throne on earth? Rarely has a new player on the world stage captured so much attention so quickly—young and old, faithful and cynical—as has Pope Francis. In his nine months in office, he has placed himself at the very center of the central conversations of our time: about wealth and poverty, fairness and justice, transparency, modernity, globalization, the role of women, the nature of marriage, the temptations of power. At a time when the limits of leadership are being tested in so many places, along comes a man with no army or weapons, no kingdom beyond a tight fist of land in the middle of Rome but with the immense wealth and weight of history behind him, to throw down a challenge. The world is getting smaller; individual voices are getting louder; technology is turning virtue viral, so his pulpit is visible to the ends of the earth. When he kisses the face of a disfigured man or washes the feet of a Muslim woman, the image resonates far beyond the boundaries of the Catholic Church. The skeptics will point to the obstacles Francis faces in accomplishing much of anything beyond making casual believers feel better about the softer tone coming out of Rome while feeling free to ignore the harder substance. The Catholic Church is one of the oldest, largest and richest institutions on earth, with a following 1.2 billion strong, and change does not come naturally. At its best it inspires and instructs, helps and heals and calls the faithful to heed their better angels. But it has been weakened worldwide by scandal, corruption, a shortage of priests and a challenge, especially across the fertile mission fields of the southern hemisphere, from evangelical and Pentecostal rivals. In some quarters, core teachings on divorce and contraception are widely ignored and orthodoxy derided as obsolete. Vatican bureaucrats and clergy stand accused of infighting, graft, blackmail and an obsession with “small-minded rules,” as Francis puts it, rather than the vast possibilities of grace. Don’t just preach; listen, he says. Don’t scold; heal. And yet in less than a year, he has done something remarkable: he has not changed the words, but he’s changed the music. Tone and temperament matter in a church built on the substance of symbols—bread and wine, body and blood—so it is a mistake to dismiss any Pope’s symbolic choices­ as gestures empty of the force of law. He released his first exhortation, an attack on “the idolatry of money,” just as Americans were contemplating the day set aside for gratitude and whether to spend it at the mall. This is a man with a sense of timing. He lives not in the papal palace surrounded by courtiers but in a spare hostel surrounded by priests. He prays all the time, even while waiting for the dentist. He has retired the papal Mercedes in favor of a scuffed-up Ford Focus. No red shoes, no gilded cross, just an iron one around his neck. When he rejects the pomp and the privilege, releases information on Vatican finances for the first time, reprimands a profligate German Archbishop, cold-calls strangers in distress, offers to baptize the baby of a divorced woman whose married lover wanted her to abort it, he is doing more than modeling mercy and ­transparency. He is ­embracing complexity and acknowledging the risk that a church obsessed with its own rights and righteousness could inflict more wounds than it heals. Asked why he seems uninterested in waging a culture war, he refers to the battlefield. The church is a field hospital, he says. Our first duty is to tend to the wounded. You don’t ask a bleeding man about his cholesterol level. This focus on compassion, along with a general aura of merriment not always associated with princes of the church, has made Francis something of a rock star. More than 3 million people turned out to see him on Copacabana Beach in Rio de Janeiro last summer, the crowds in St. Peter’s Square are ecstatic, and the souvenirs are selling fast. Francesco is the most popular male baby name in Italy. Churches report a “Francis effect” of lapsed Catholics returning to Mass and confession, though anecdotes are no substitute for hard evidence, and surveys of U.S. Catholics, at least, see little change in practice thus far. But the fascination with Francis even outside his flock gives him an opportunity that his predecessor, Benedict XVI, never had—to magnify the message of the church and its power to do great good. None of which makes him a liberal—he also says the all-male priesthood is not subject to debate, nor is abortion, nor is the definition of marriage. But his focus on the poor and the fact that the world’s poorest 50% control barely 1% of its wealth unsettles those who defend capitalism as the most successful antipoverty program in history. You could argue that he is Teddy Roosevelt protecting capitalism from its own excesses or he is simply saying what Popes before him have said, that Jesus calls us to care for the least among us—only he’s saying it in a way that people seem to be hearing differently. And that may be especially important coming from the first Pope from the New World. A century ago, two-thirds of Catholics lived in Europe; now fewer than a quarter do, and how he is heard in countries where being gay is a crime and educating women for leadership roles is a heresy may have the power to transform cultures in which Catholicism is a growing, even potentially liberating force. These days it is bracing to hear a leader say anything that annoys anyone. Now liberals and conservatives alike face a choice as they listen to a new voice of conscience: Which matters more, that this charismatic leader is saying things they think need to be said or that he is also saying things they’d rather not hear? 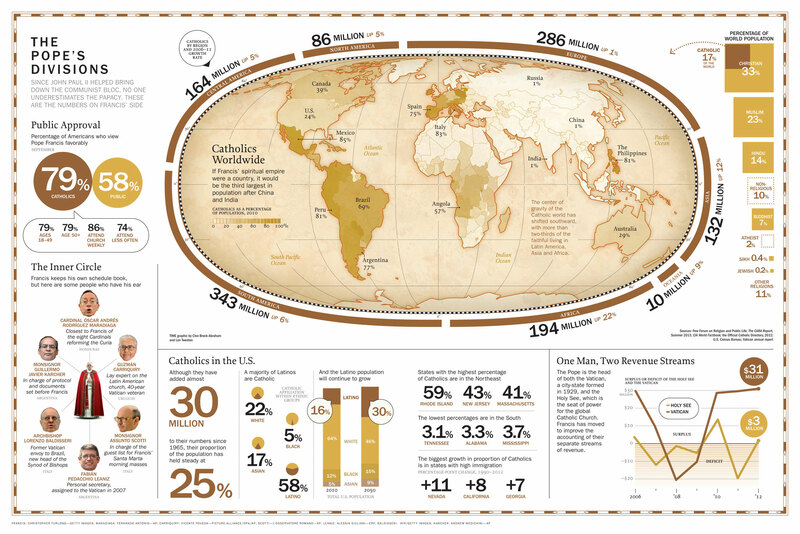 As part of the Person of the Year article on Pope Francis, Time Magazine provided an infographic on The Pope’s Divisions which details the power of the papacy and the positive numbers that are working for Pope Francis. I have included a copy below for you to review (click on the image to enlarge).